Undecking the Halls – Weather Update – Snowball Fight Anyone? Update: Due to the winter storm warning our plan to dismantle decorations at North Highland Park will be postponed until Saturday afternoon at 1:00 pm. Hopefully this will allow time for any wintry mix to move out of the area. It will still be cold though, so dress warmly and plan to have some fun in the snow! 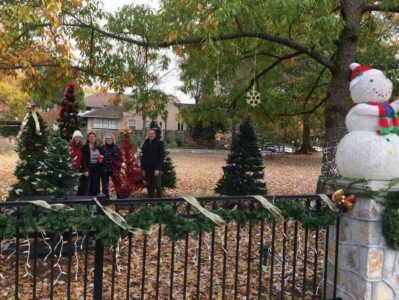 The feedback on our North Highland Park holiday decorations has been very positive. 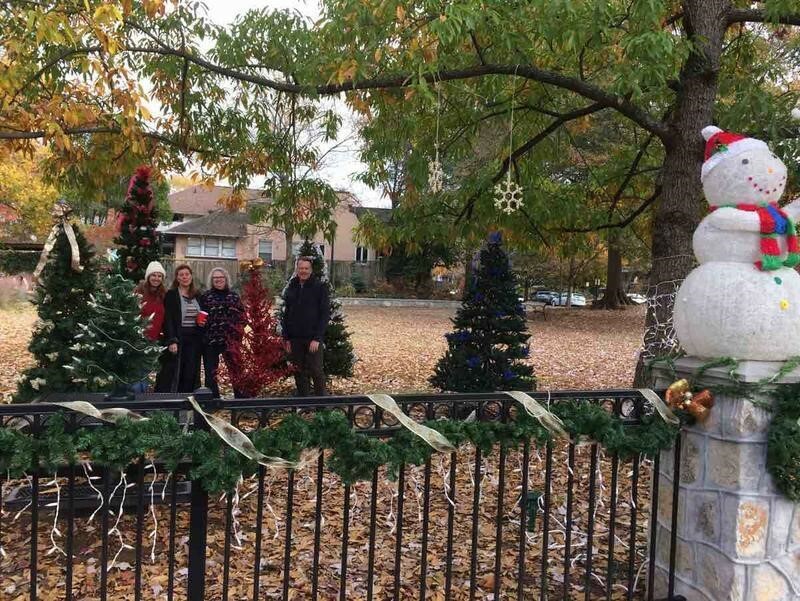 All of the trees, lights, wreaths, and even Frosty were donated by residents who no longer needed these items. Volunteers set up the decorations a few weeks ago, and an army of elves (mostly anonymous) stopped by to keep everything in working order as rain, wind and other acts of nature tried to defeat our holiday cheer. Sadly, now it’s time to think about packing away all this holiday splendor! What are you doing on Saturday January 7th? Volunteers will meet at the park again on the 7th at 10:00 am to dismantle and pack away these treasures for next year. If you can lend a hand, please join us! Also, for that tree you have at home, Home Depot is a sponsor for “One for the Chipper” again this year. Drop off your completely undecorated natural tree on Saturday, January 7th between 9:00 am and 4:00 pm and it will be turned into mulch to be used locally. 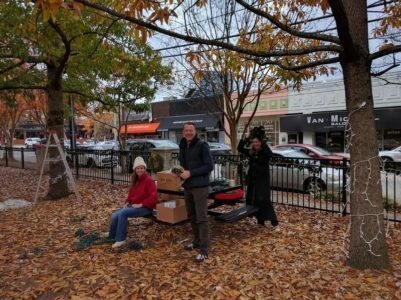 Virginia-Highland Conservation League volunteers originally sold almost 400 bricks to help fund construction of North Highland Park at the corner of N. Highland and St. Charles Ave., which opened in 2013. After installation of the first wave of bricks, we learned we had spots for 105 more, and we now have just 53 bricks left to sell, then that’s it! All the bricks sold since the park opened in 2013 will be installed by the Spring of 2017, and proceeds will go toward payoff of the remaining mortgage on the land. To learn more or buy, click here. Express Your Passion for VaHi Through Photography – and See Your Work on Public Display! The Virginia-Highland Civic Association is partnering with Atlanta Celebrates Photography to create a ‘neighborhood-based’ temporary public photography exhibition that will be on display at North Highland Park (St. Charles & North Highland) this summer – beginning Summerfest weekend! The theme of the exhibition is ‘Life in Virginia-Highland’ and photography submissions will be accepted from anyone who lives, works, plays, visits or goes to school in VaHi. All lens-based enthusiasts can submit and upload five of your best photos depicting ‘Life in Virginia-Highland’ for consideration. A select group of the submitted photos will be featured on several banners that will be on display at the park. Each banner will feature large versions of the selected images with the photographer’s name and image title displayed below. Submissions can be from old photos or from recently taken ones. Submission is free and entry will be easy. Not all submitted photos will be chosen for display. Submission deadline is May 8, 2016 at midnight so don’t waste time. Have fun and get your creative juices flowing, whether you’re an amateur or master, junior or senior! The goal is to submit photos that allow us all to see what makes our unique and beautiful neighborhood so special to you! Click here to register and submit images for the exhibition. Share the news and be sure to submit – and show us what makes Virginia-Highland so special to you!! 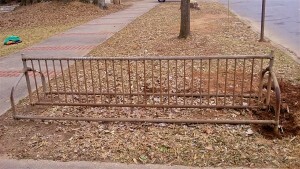 The bike rack at its original location at North Highland Park. Photo courtesy Jack White. 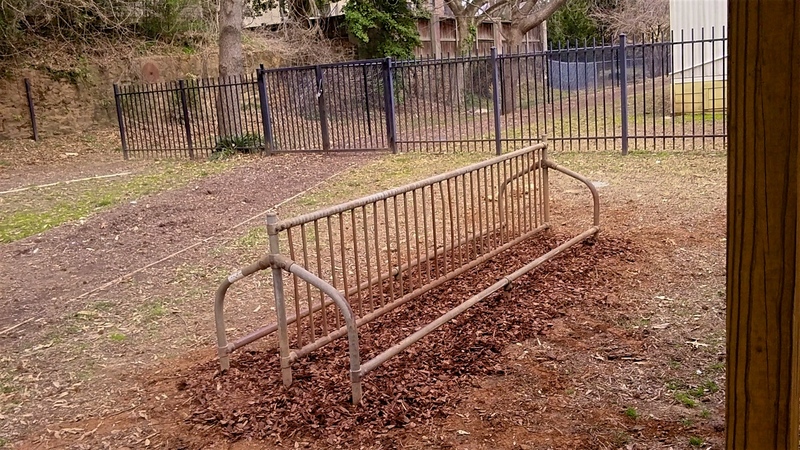 The bicycle rack that has lived at the northeast corner of N. Highland and St. Charles at North Highland Park – likely since the days of the public library – has a new home. Due largely to its obscured location at the park, the rack has received very little use since the lot was converted to greenspace. After noting the increasing use of pedal-power as a mode of transport for students heading to and from Inman Middle School (even more so now that the weather is getting nicer)—and the reality that IMS’ existing bicycle racks were often filled to capacity – the idea of relocating and donating the rack to the school was circulated with IMS staff and the LSC. Several staff members both acknowledged the need for another bike rack and resoundingly supported the gift. 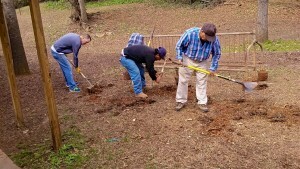 Workers prepare the bike rack’s new site at Inman Middle School. 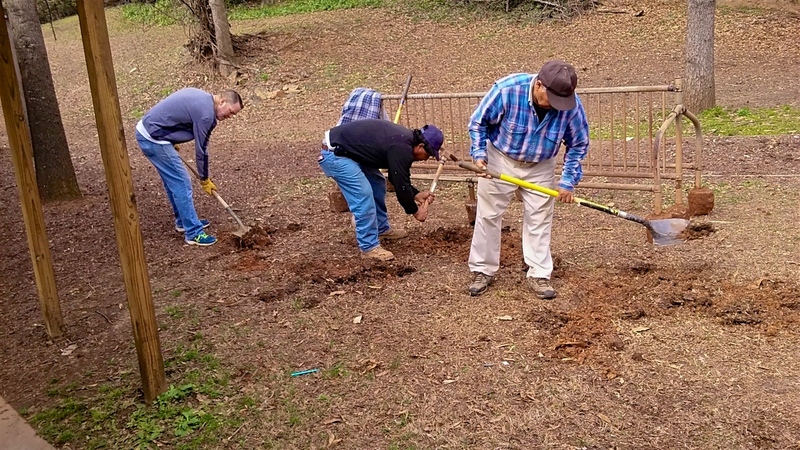 VHCA Board member David Brandenberger shovelling at far left. Photo courtesy Jack White. 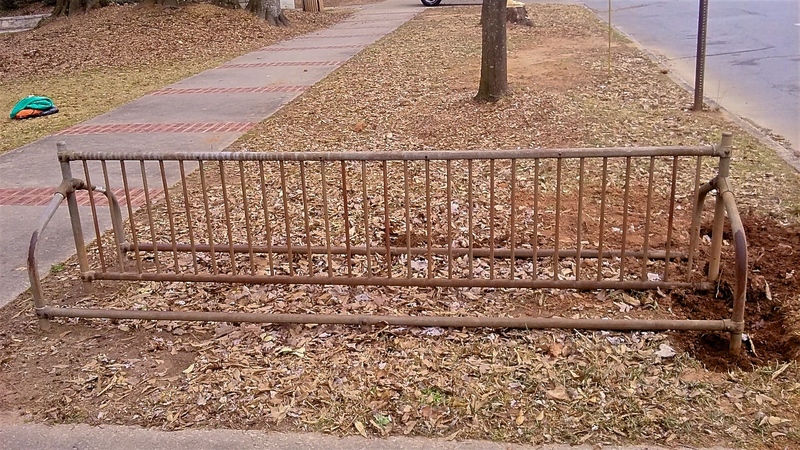 On a fine February Saturday two weekends ago, several neighborhood volunteers and Board members dug up the 10’ long, heavy steel structure, hoisted it into a truck, transported, and then installed the ‘new’ bike rack at Inman next to the portables. We are happy to report that the rack is now experiencing unprecedented use in its second career and new location! 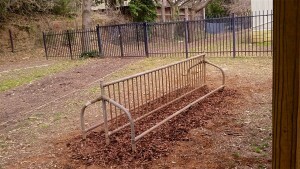 The repurposed bike rack at its new location at Inman Middle School. Photo courtesy of Jack White. We note that Inman now has five bike racks (up from two a year ago), a measurable reflection of the growth of cycling in VaHi. It’s also a reminder to us all to drive appropriately and be on the alert for cyclists of all ages at all times – and let’s please double our attention around schools. 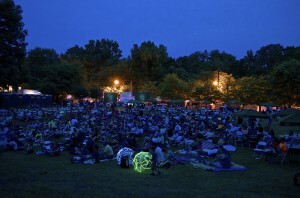 Dedicated in 2013, North Highland Park has quickly become one of our neighborhood’s most popular features. Residents and visitors alike can be seen enjoying the wonderful green space – reading a book, relaxing under the trees, walking a dog, or eating lunch at one of the picnic tables along North Highland Avenue. Click here to read more about the park and how it came to be. One of the ways we’ve raised money to maintain the park and pay down the debt owed on the mortgage is by selling commemorative bricks. There are already several sections of bricks installed along St. Charles Pl. but we still need to sell 37 more before we can engrave and install the bricks in the last section. Several residents who have already purchased bricks have been waiting more than a year for these final bricks to be sold. You can help us complete the project. Please consider showing your support for the park by purchasing one of the last bricks to be sold. A tax deductible $100 donation gets you the brick and up to three lines (up to 14 characters per line) to inscribe as you see fit. 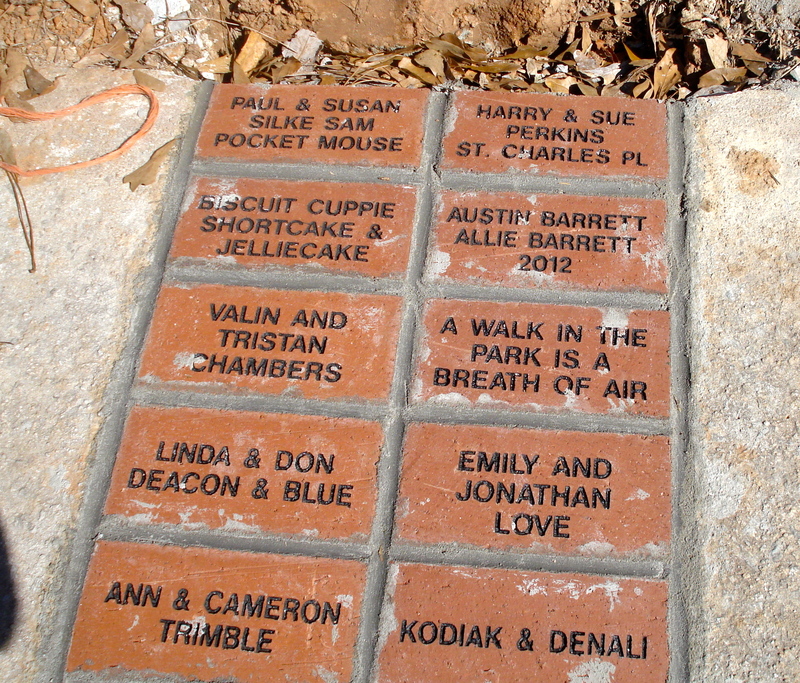 Leave your own legacy in North Highland Park and/or give an inscribed brick as a gift (each comes with a certificate suitable for gift-giving). So, act now and be one of the last to buy a brick at North Highland Park. Click here to order yours today. 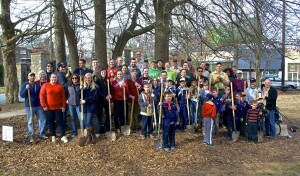 Thanks so much for your support of Virginia-Highland’s newest green space! Anyone new to the neighborhood might not know that in December of 2008, the Virginia-Highland Civic Association, Inc. (VHCA) closed on the purchase of two lots at 1076 and 1082 St. Charles Place, at the corner of St. Charles Place and North Highland Avenue. Formerly the site of a public library, these lots had remained vacant and often overgrown for more than ten years. Financing for the acquisition came through the Georgia Land Conservation Program (GLCP). VHCA was the first non-profit in the state to be approved for funding under this program. 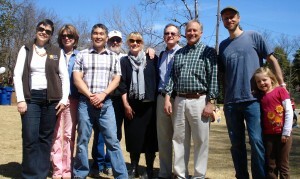 The association raised almost $160,000 (including a $50,000 grant from Park Pride), and the two lots were developed as an environmentally-friendly, passive park for the community’s residents and visitors. The park opened on March 16, 2013. 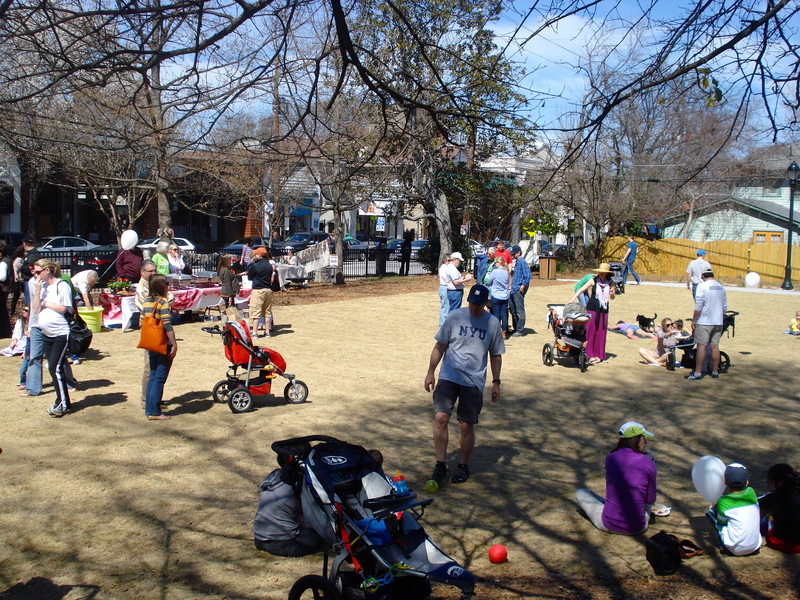 In contrast to city-owned and maintained parks, North Highland Park is privately-owned by our neighborhood through VHCA. 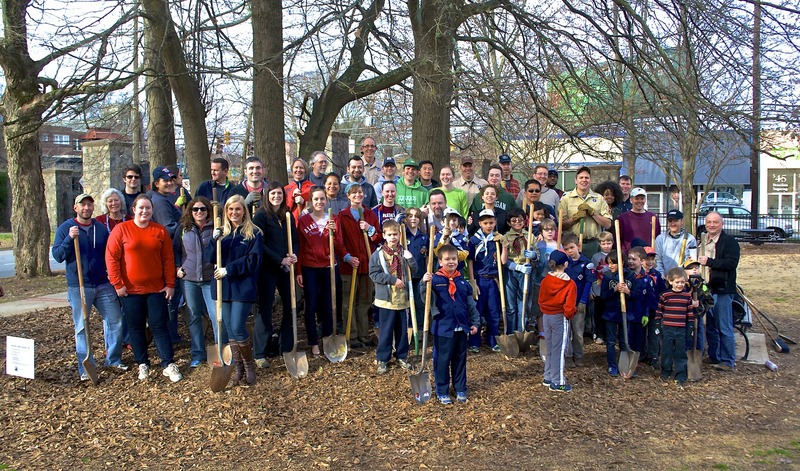 The park is not only a respite from asphalt and noise; it is also a bio-retention project for stormwater management. A rainwater garden and a large selection of native foliage capture and hold rainfall on site instead of sending it to the city’s stormwater system. Soil and plants naturally remove pollutants from stormwater. This park is also a major element in the future of the Atkins Park commercial area, the rejuvenation of which was one of the many focus points of the Virginia-Highland Master Plan. 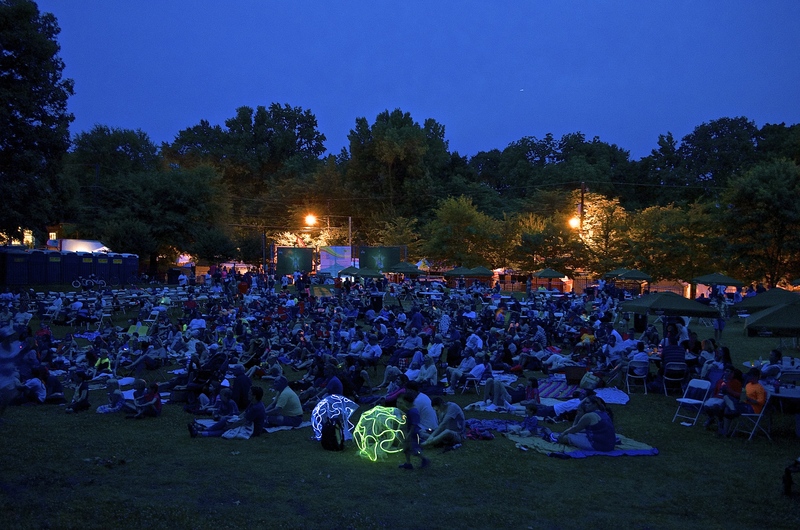 VHCA pays the debt on the park through proceeds raised by our major fundraising efforts – Summerfest and the Tour of Homes – and additional events sponsored by the Association’s fundraising arm, the Virginia-Highland Conservation League, Inc. (VHCL). Our goal is to pay off the mortgage as soon as possible to ensure the park remains ours forever. To that end, VHCA has made several additional payments over the past two years to further reduce the principal balance on the loan. We are excited to report that one neighbor who is passionate about the park recently gave us an extremely generous donation of $27,000! We are very excited about this gift and will be adding funds to pay down the mortgage by an additional $35,000. We thank this generous benefactor – who wishes to remain anonymous – so much! By April 1, 2015 the remaining balance on the loan will be ~$432,000, which means we will have retired over half of the initial debt in just over 6 years of the 15-year GLCP loan term. While we are very happy about that, we still have more money to rise, and we have not lost sight of the end goal of retiring the debt completely. Plans are already underway for this year’s Summerfest, which has been a solid money-maker for our community. If any residents wish to spearhead fundraising ideas, please contact me at ppapner@earthlink.net. Residents who have followed this project know that a significant amount of revenue for the park’s construction came from the sale of engraved bricks that are installed along the sidewalk that runs along St. Charles Place. Brick sales brought in more than $38,000 – one brick/one $100 donation at a time. After park construction was completed, we realized we still had space for more bricks. The excitement surrounding the opening of the new park enabled us to sell 24 more bricks; however, we need to sell another 37 before it’s economically feasible for us to engrave and install the final group of bricks. We are asking the community to help us sell those final 37 bricks! Please consider ordering one so that we can complete this final wave. If you order a brick, you can have it engraved with up to 3 lines (14 characters, including spaces). Please consider doing so! 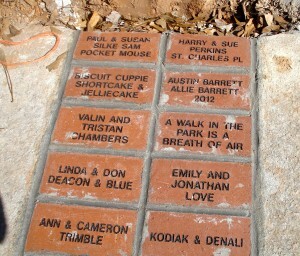 You can purchase a brick online – or simply contribute to the park – at https://vahi.org/parks/contribute. If you order a brick as a gift, you will receive a certificate suitable for gift-giving. Thank you and we hope to see you in North Highland Park soon!